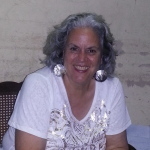 NOVEMBER 5: CAROLYN BRANDY ~~ CONGA MAGIC! Come have fun learning some Afro-Cuban rhythms and songs. Carolyn will break down some of the basics of this charismatic and melodic drumming style. So much of our popular music uses rhythms that were preserved and created in Cuba. The repertoire is huge, but there are concepts and basics that underline all of this incredible music. We will be exploring some of these such as Tresillo, Clave and Polyrhythm and their connections to each other and to this music as we learn some of the beautiful Rhythm Songs that come from Cuba.